Cisternino, Puglia, Italy. Saturday/Sunday/Monday 04/05/06-August-2018. 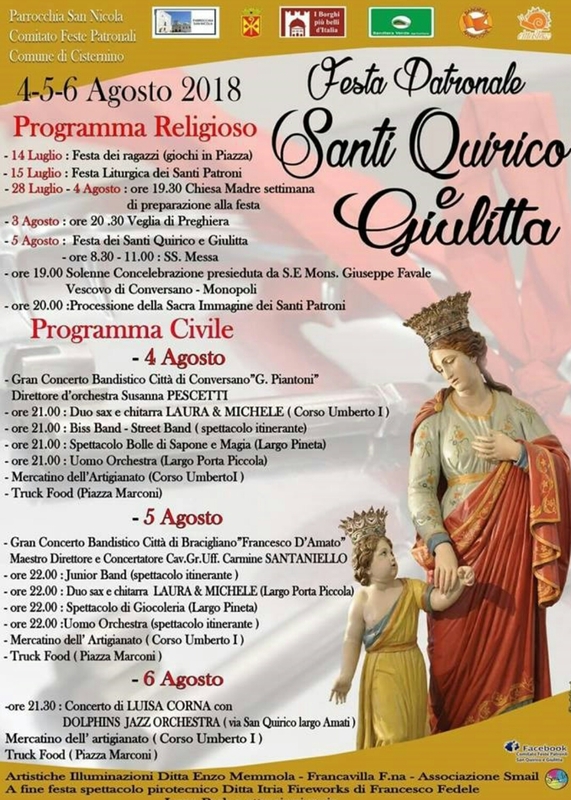 Three day of music and festivities to celebrate Cisternino's Patron Saints Quirico e Giulitta. ... and out next to our front door and off down Corso Umberto. The evening concert in the town square was a rousing brass band editions of Turandot and The Barber of Seville from the Gran Concerto Bandistico Città Di Conversano. 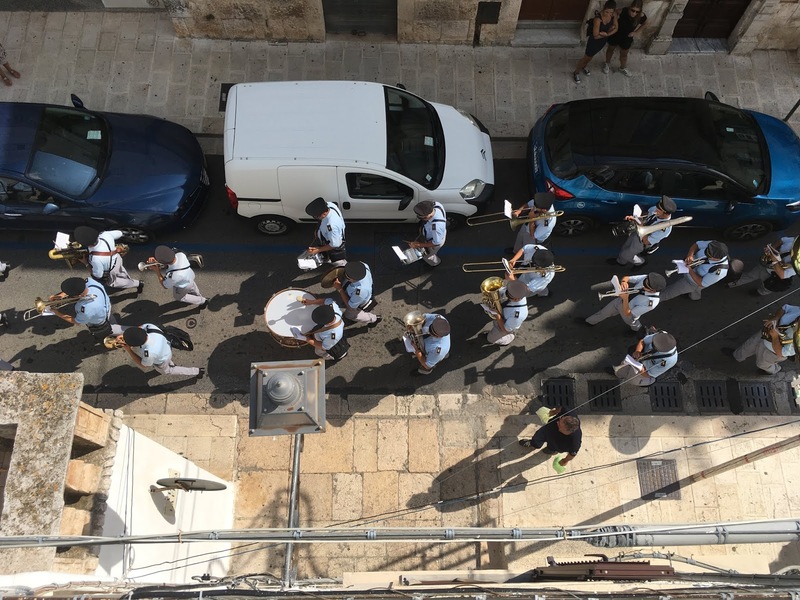 Instead of the usual Aperitivo Classico we were treated to more brass band (they seem to be a big thing round here). Cinderella from the Gran Concerto Bandistico Città Di Bracigliano. 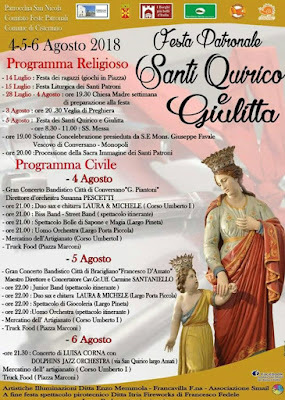 The evening was the main religious part of the celebrations which means a procession of the statues of Quirico e Giulitta from the eponymous church around the town along with marching band, the town dignitaries and a following of the townspeople. The procession passes under our window. It was more music wherever you looked. I went for leisurely circuit of the town at 11pm. First sax and guitar at the end of our street doing an excellent version of "Summertime". Through the arch of the Porta Piccolo into the old town - a group who don't seem to be on the official poster busking outside Micro vegan restaurant. 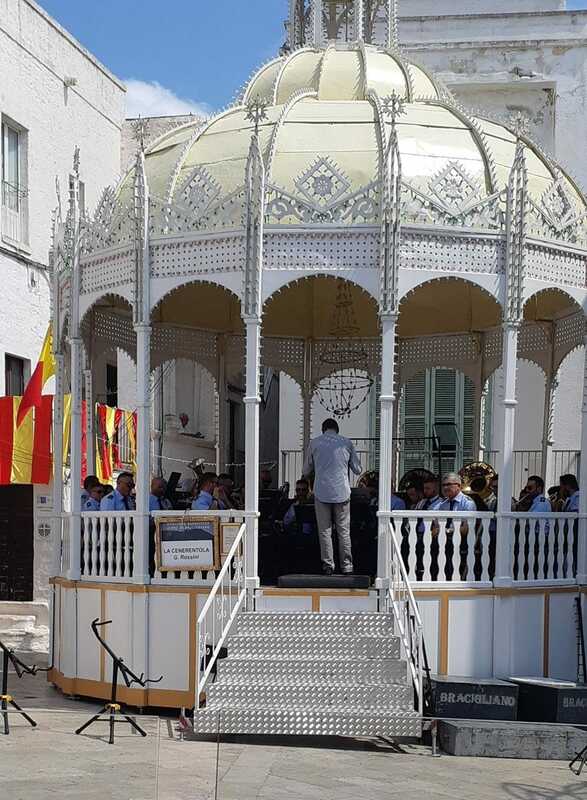 In the main square it was back to classical with a selection of Wagner on the bandstand. On the other side of town out through the Porta Grande just up from our rented apartment the Junior Band giving it some welly on trombone and sax. The illuminations on Via San Quirico looking lovely. All three days had craft stalls along Corso Umberto and food trucks at the end in Piazza Marconi. The headline act for the Monday: Luisa Corna and the Dolphins Jazz Orchestra in Largo Amati. We stopped off for a digestivo at Chirico Bistrot (formerly Bar Palazzo Amati) and people watched to the sound of the band. A quick stroll up the the church of San Quiroco to have a peer inside. The statues were back in place. Cinderella-like we were tucked up in bed by midnight and so only heard the spectacular firework display at 00:30. Congratulations to the Comune (town council) for another fine festival.